Last week, after the U.S. Postal Service announced they plan to stop all delivery on Saturdays except for packages, I wrote on how the USPS wants a bigger part of eCommerce order fulfillment. Over the weekend, their apparent target on the world of eCommerce got even clearer as they announced they’re also going to deliver packages on Sunday! Innovation is right, at least for the USPS. As of today, consumers can receive packages on Saturday and Sunday from competitors of the Postal Service, but that often comes with an upcharge. This announcement from USPS is a strong indicator of the company’s long-term vision, which is focused on acquiring a bigger share of the eCommerce order fulfillment market, and frankly, I think it should have FedEx and UPS a little worried given the Postal Service’s infrastructure, current advantages relative to small parcel delivery, and perhaps even a willingness to lose money to gain market share in the short term. After all, the Postal Service is used to losing money. Donahoe’s revelation comes soon after the Postal Service reported a net loss of $1.3 billion in the final quarter of 2012. 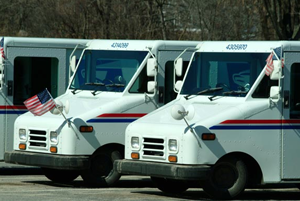 This loss was due in part to the continued decline of First Class Mail, which was down 4.5 percent during the period. The silver lining? You guessed it….packages! Package delivery was up 4 percent for the final quarter last year, which took into account the biggest online shopping holiday season on record. There’s no question that big changes are to come in the future if Postal Service is going to survive. And while the USPS cannot yet operate independently like a normal business, they are in part putting forth a business strategy, and that strategy is aimed squarely at the rapidly-expanding market of eCommerce. That’s great news. eCommerce folks of all types will rejoice knowing they can get orders out to customers another day sooner. Thanks, Adam. Yes, it will be interesting to see how the battle to increase market share by capitalizing on heavier eCommerce fulfillment demands will play out between the major shipping carriers over the next few years. In fact, the USPS already delivers Express Mail in many cities on Sunday. However, in an effort to expand operations, they WILL soon begin delivering parcels on Sundays nation-wide. This is fueled in part by amazon.com, who now offers next day delivery – including Sundays – for a fee. We (I work for the USPS) have been delivering these next day packages for a month now on a pilot program, and it’s ready for 7 day a week service.